Ottawa – September 23, 2015 – The average tuition and other fees for Canadian undergraduates have tripled between the academic years 1993/94 and 2015/16, ranging from an increase of 35% in Newfoundland and Labrador to 248% in Ontario – according to a recent report released by the Canadian Centre for Policy Alternatives (CCPA). 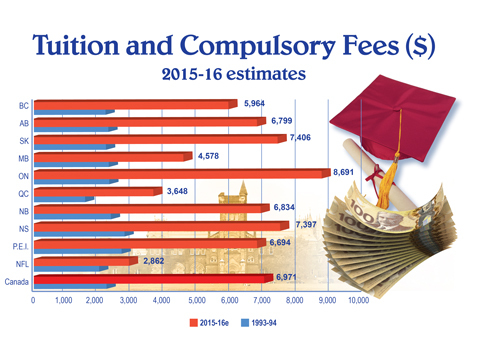 This increase in tuition fees is well above the inflation, which only rose by 48.71 per cent between 1993 and 2015. Tuition fees rose in all but one province, Newfoundland and Labrador, where tuition fees for undergraduate and graduate students have been frozen since 2003/2004. Government (public) funding, as a share of university operating revenue, has declined from 77% in 1992, down to almost 60% in 2002, and falling to 55% in 2012. Over the same period of time the tuition fees increased as a component of university funding from about 20% in 1992, up to 33% in 2002, and rising to over 37% in 2012. This year, Newfoundland and Labrador, where tuition fees are already the lowest in Canada, was the first province to entirely replace provincial loans with needs-based grants. Newfoundland and Labrador will maintain its position over the next four years as the most affordable province on both the median and low-income Cost of Learning Index because of its tuition freeze and its shift to needs-based grants. For median-income families, Ontario and New Bruns­wick are the least affordable provinces(in spite of Ontario’s in-province bursary rebate). For low-income families, Saskatchewan is the least affordable; followed by Ontario and Nova Scotia (all three provinces have an in-province bursary). Source: Canadian Centre for Policy Alternatives (CCPA) – What’s the Difference? UFCW Pride – Union Pride! Tell Mama Earth Organics to respect workers’ rights! National Food Policy needs Food Workers! End Discrimination Against First Nations Children NOW! Paid Leave for Survivors of Domestic Violence NOW! Tell Walmart: Protect workers’ safety in Bangladesh!